“No need to fear us.” That was the Muslim Brotherhood’s message to the US in 2005. Seven years later, they are trying to offer the same reassurance. Al-Shater is now the deputy chairman of the MB and the Freedom and Justice Party’s (FJP) candidate for the Egyptian presidential elections. The article aimed to ease Western powers’ concerns over the then rising power of the MB, after they had won one-fifth of the parliament for the first time. The 2005 article even committed the MB to “respect the rights of all political and religious groups” and made no mention of the application of Islamic law. Today, al-Shater is reaping the fruits of his rapprochement with the West, and especially the United States, in his run for Egypt’s top post. 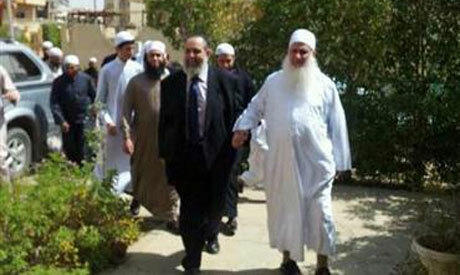 His position in the race is the opposite of that of the Salafi candidate Hazem Salah Abu Ismail. The latter is facing disqualification because his mother is said to have US citizenship. Abu Ismail also announced that he will be suing the interior ministry for refusing to provide documentation about his mother’s nationality. Earlier this week, Reuters had spoken to Sondos Asim, a member of the FJP’s foreign relations committee and editor of its official English-language website. At a forum at Georgetown University in Washington, Asim said they were there “to start building bridges of understanding with the United States,” according to Reuters. “We acknowledge the very important role of the US in the world and we would like our relations with it to be better than before,” he added. Abdul Mawgoud Dardery, an FJP lawmaker from Luxor, says the party is dedicated to the principle of a “civil state” and the objectives of sharia rather than its specific practice. He said he will form a group of influential personalities to assist the parliament in reaching this goal. The US government denied any coordination with the MB on the upcoming presidential elections in Egypt. “Our decision comes from the Brotherhood’s shura council,” he insists. He added that what applies to international conventions should apply to the Camp David peace accord with Israel. In other developments, the US government denied any coordination with the MB on the upcoming presidential elections in Egypt. Several meetings were held between the group and US senator John McCain and the US Ambassador to Egypt Anne Patterson during the senator’s visit to Egypt last February. “McCain and Patterson were not asked for their support, nor did they offer their support, for such a proposal from the Muslim Brotherhood,” the statement added. “The question of who will run for office in Egypt is an internal matter that is entirely up to the Egyptian people. The US takes no position on this subject,” it said.